The immigration department changed a web page about asylum seekers to swap the word "illegal" for "irregular" as a debate was erupting between the federal government and Ontario on the issue, CBC News has learned. The change in July came 18 months after the web page, titled "Claiming asylum in Canada – what happens?," was first published — and just one day after federal Immigration Minister Ahmed Hussen suggested the provincial Progressive Conservatives were mistaken in the way they were describing the status of people entering Canada at non-official entry points. Throughout the web page, which is intended to provide information on Canada's asylum laws, the words "illegal" and "illegally" were switched to "irregular" or "irregularly" in six separate instances on July 10, 2018. On July 9, Hussen attacked Ontario's newly elected premier, Doug Ford, and provincial Social Services Minister Lisa MacLeod, who oversees the immigration file, over their use of the term "illegal border-crossers" when describing asylum seekers crossing at non-official border points. As Hussen was telling a news conference Ford and MacLeod were wrong to call those border crossings "illegal," his own department was still using that word to describe such crossings on the asylum web page. The next day, the wording was changed to "irregular." The change was not ordered by Hussen, said Mathieu Genest, the minister's spokesperson. The Wayback Machine website, an open online library that archives published internet pages, retains a snapshot of the immigration web page as it appeared on July 4, 2018 — when it was still using the word "illegal." The backgrounder was published originally on March 2, 2017. The web page lays out the process for seeking asylum or claiming refugee status after crossing the U.S.-Canada border at a designated port of entry, or after arrival at an unofficial crossing point. "The Canada Border Services Agency (CBSA) and the Royal Canadian Mounted Police (RCMP) play an instrumental role in protecting Canada's border, deterring and intercepting irregular entry to Canada and keeping Canadians safe. CBSA, the RCMP and its domestic and international partners work together to intercept individuals who enter Canada irregularly," the website now reads. "Given significant confusion around the terminology, the department made incremental updates to all pages to minimize mischaracterization of asylum seekers as being in Canada illegally," said Nancy Caron, spokesperson for Immigration, Refugees and Citizenship Canada, in an email to CBC News. "‎Until their claim is decided, or if they are found to be a refugee, a person will not be charged with an offence based on how they entered Canada." However, the change does not appear to be consistent across the department's website. Another web page that provides monthly updates on the numbers on asylum claims and interceptions still refers to "illegal entry to Canada" and to the CBSA and RCMP's efforts to "intercept individuals who enter Canada illegally." 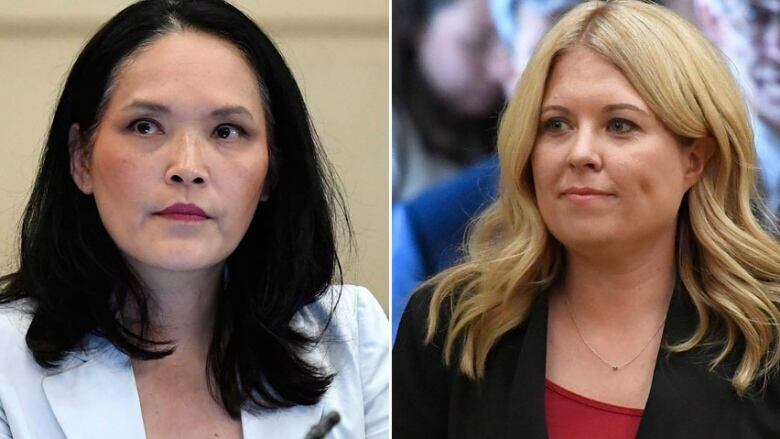 Conservative immigration critic Michelle Rempel dismissed the changes and said she's more troubled that the government has not tabled a concrete plan to deal with the problem. "They need to be focusing on solving this problem that's being created by tens of thousands of people illegally crossing on the border into Canada after having reached the United States, and the strains that it's placing on Canada's social program and, frankly, the backlog it's creating," she said. NDP immigration critic Jenny Kwan — who has pushed all levels of government to stop using the word "illegal" in the context of asylum-seekers — welcome the department's changes, but noted the government's decision to do it under the radar. "I think it's very significant for that change to have been made, and for it to be acknowledged publicly really through their website. I guess I should say 'quietly' through their website, because the government loathed to admit that they are wrong," she said. "When we call asylum seekers 'illegals' we are denigrating them as people." The language surrounding the emotionally-charged political debate over border-crossers has been a source of friction and confusion. Last March, Hussen was asked by Conservative MP David Tilson at a committee hearing which word he prefers to use to describe the act of crossing the border to claim asylum at an irregular crossing point. "I have used the word 'illegal' and I have used the word 'irregular,' and I think both are accurate," Hussen replied. Weeks later, the immigration minister had changed his tune. On July 13, Hussen called MacLeod's approach to the issue of asylum seekers "not Canadian." "Asylum seekers are processed in a separate queue at the IRB and all the other regular immigration programs are processed by IRCC, and conflating the two knowingly is irresponsible, it's divisive, it's fearmongering and it's not Canadian. And it's very dangerous," he said. "The minister should sit down, have a nice cup of tea, calm down a little bit, and maybe phone me and apologize for calling me un-Canadian," she said. "There is a problem at the border. The border must be enforced." Caron said that the department chose to standardize its terminology on the website "to underscore that it is not illegal for someone to enter Canada for the purpose of making an asylum claim at any point along the Canada-U.S. border." In late July, MPs held special "emergency" committee hearings that led to heated debates between the Liberals and opposition parties over the government's handling of border-crossers. Kwan has made repeated requests for all parties to stop calling asylum seekers "illegal" because it generates negative public opinion. "The immigration refugee protection act clearly states when a person crosses over to the border directly or indirectly for the purposes of seeking asylum, they are not committing a criminal offence," she said. 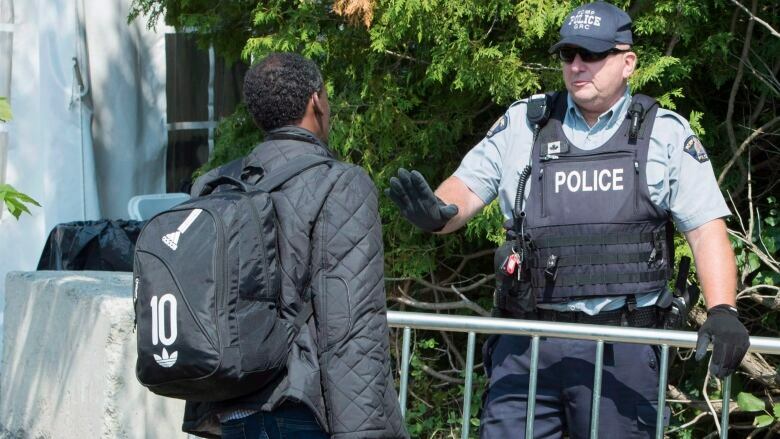 According to the RCMP, authorities intercepted 14,125 border crossers at the border between Jan. 1 and Aug. 31, 2018. CBC uses the terms "illegal crossing" or "illegal migration" when referring to the act, but does not describe the individual making the crossing as an "illegal migrant" or "illegal border crosser." Crossing into Canada outside a formal border point is against the law under the Customs Act. The UN Convention on Refugees acknowledges throughout its statutes that some refugees cross borders illegally and states that they should not be prosecuted for it if they are legitimately seeking asylum. It's against the law to enter Canada without the proper papers, and without going through an official port of entry during designated operating hours, according to the federal Customs Act. Asylum seekers are not prosecuted for such illegal crossings, pending a review of their refugee applications, according to the Immigration and Refugee Protection Act. But this does not make the crossing, itself, lawful. The government reserves the right to pursue charges later. Applicable international law uses similar language. For example, the UN Status of Refugees Convention and Protocol specifically refers to such unauthorized border crossings as "illegal entry." The convention goes on to state that countries "shall not impose penalties" on refugee claimants solely because of "their illegal entry" as long as they "present themselves without delay to the authorities and show good cause for their illegal entry or presence." For this reason, it's OK to use terms such as "illegal border crossings" and "unlawful border crossings". Some politicians and refugee activists prefer the term "irregular border crossings". While the word "irregular" is becoming more common, choosing between "illegal" and "irregular" is now also seen by some as a partisan decision. CBC News strives to avoid taking sides in political debates over language. We believe the modifier "illegal" is generally preferable because it is accurate and entrenched, and so, instantly helps our audience understand the story. "Irregular" is less familiar and more bureaucratic, but there's no ban against using the word as long as a given story's context makes its meaning clear. Just be sure to explain or define "irregular border crossing" if you use the term (e.g., "refugee claimants entering Canada without going through official border points"). It's worth noting that "irregular" is a statutory designation found in Section 20.1 of Canada's 2001 Immigration and Refugee Protection Act. The once-obscure jargon started becoming more widely used by federal officials in 2017. Be aware that while the modifier illegal is an entrenched and acceptable way to describe the general act of unlawful movement across borders (e.g., illegal immigration and illegal migration), it's viewed by many as a poor way to describe people themselves. Instead of using a term such as "illegal immigrant," therefore, prefer specific detail (e.g., "entering or living in a country illegally"). Another option is to use a neutral modifier that applies to a given set of facts (e.g., undocumented worker). The same principle applies to asylum seekers and refugee claimants. While it's OK to describe an act as technically unlawful (e.g., an illegal border crossing), we should not call people "illegal border crossers." Avoid shorthand such as "an illegal" or rounding up "the illegals," which reduces the identities of human beings to a criminal act they're accused of committing. 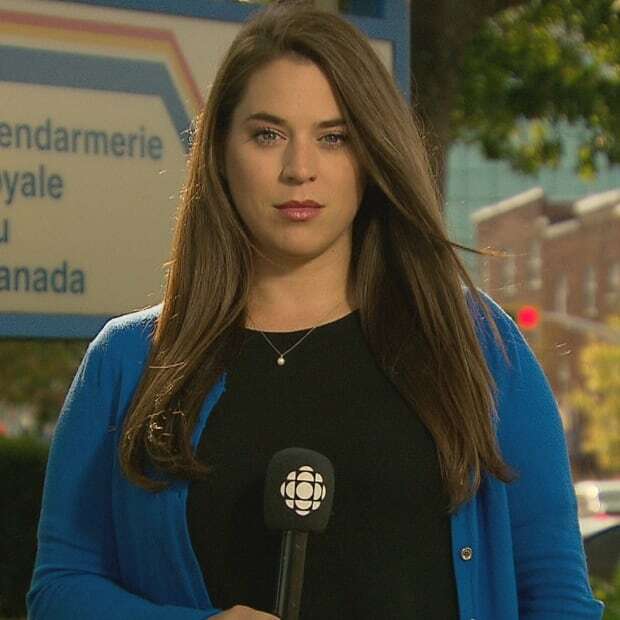 Olivia Chandler is a journalist for CBC News in Ottawa. Immigration and Citizenship: Claiming asylum in Canada - what happens?